Starting from Glasgow by Rosemary Trollope is a collection of reminiscences of a very comfortable Glasgow childhood by the author Joanna Trollope’s mother. 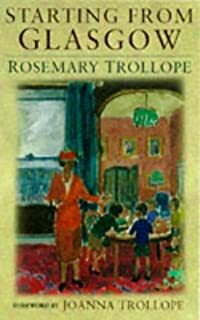 Rosemary Trollope was a prolific letter writer and it seems that when she ran out of news to write about she took to including tales from her childhood in with the letters. Joanna Trollope sent one of those stories to the literary editor of the Glasgow Herald who decided to publish it and others he was sent. Glasgow is more usually portrayed as a violent, rough working class city so it’s particularly pleasant to read about the genteel life that was also lived there. As Joanna Trollope says in her introduction Glasgow is a city, still remarkable for its personality and its warmth – a very good city, in fact, from which to start. There are some photographs in this book but Rosemary Trollope has illustrated it herself. It’s not all privileged fun and frolics though, at one point a deranged cook tried to kill the children of the family with arsenic! This is an interesting and entertaining read, especially if you know Glasgow although as Rosemary Trollope moved to England when she got married, the reminiscences aren’t exclusively about the west of Scotland. One of the many things that she preferred about Glasgow/Scotland was the fact that people could say her name properly. In Scotland Rosemary is pronounced with equal emphasis on each part of the name, whereas in England she was always Rosem’ry. She’s right about that but I hadn’t realised it before. This entry was posted in Books and tagged Joanna Trollope, Rosemary Trollope, Starting From Glasgow by Katrina. Bookmark the permalink.